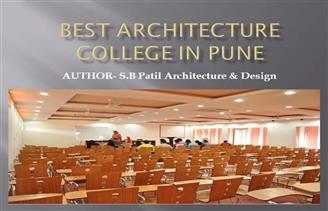 Singh education academy has given list of top Architecture colleges in Pune. The list of colleges includes some of the best Architecture institution Colleges of Pune.Singheducation has listed top Architecture colleges based on several parameters as discussed below. Admission procedure: The admission in the Architecture colleges of Pune is based on the NATA Main score. After clearing the NATA, the candidates also have to appear in the state Architecture exam of Maharashtra i.e. MH CET. Architecture colleges/universities also consider the score of MH CET for admissions in Architecture programmes. Pune is the 7th largest metropolis in the republic of India and 2nd in Maharashtra state after Mumbai. Pune is situated on Deccan plateau at 560 meters above sea level. The city is known for its old economy industries and now it is a hub for automobile manufacturing and IT companies. The Pune district of Maharashtra has many famous private and government engineering institutes offering training and research in the fields of IT, Management, Engineering, and attracts many students not only from India but from all over the world.